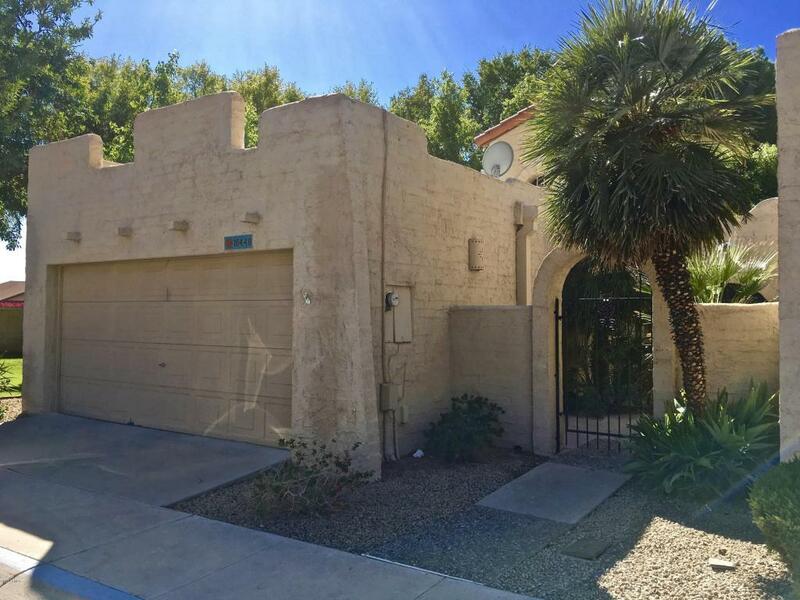 Rare opportunity in the lovely, pristine GATED community of Mission Square. This end unit with only ONE common wall illuminates with natural light from numerous windows and skylights. NEW designer interior two-tone paint. NEW ceiling fans, NEW Stainless appliance, NEW carpet. Open floorplan features breakfast bar looking in the living room, vaulted ceilings, wood-burning fireplace and access to private fenced patio. Tile in all the right places with new carpet in the bedrooms makes this home cool and cozy. The MASTER SUITE features french doors leading out to back patio and a private bath w. tiled shower and spacious vanity. The private back patio is shaded by a large mature tree and has a private gate to greenbelt behind unit. THIS HOME IS MOVE IN READY!! !